Apple, the Cupertino-based high-tech giant company still intends to create a Foldable iPhone that has a large screen which can be compressed into a compact size. However, this can be done by utilizing a middle section that is substantially flexible for the screen to fold without breaking. The “Electronic devices with flexible displays” patent that was permitted by the U.S. Patent and Trademark Office provides particulars on how a folding mobile gadget must be constructed. According to the patent, although the gadget is foldable, it must be sufficiently workable to have a screen on one entire side of the said gadget like a tablet or smartphone. However, it must only have one display with a discernible line in the middle. The patents likewise detail that the theory is based on the utilization of numerous flexible elements within the middle portion of the Foldable iPhone. The patent states that when the device is flexed or folded, a compression material is present within the fold’s inside including a thinning material outside. However, the compression material within the fold my present some dilemma in terms of layer display. In order to address the aforementioned issue, the patent recommends the utilization of recesses within the material that secures the display layer in the middle portion of the gadget. This lessens the cluster of mass along with the volume of stress on the layers that are near the inside of the fold. Solid inflexible glass covers may be used for the display sections which the fold does not affect and a flexible cover that stretches between the gap of the two solid portions of the gadget. The glass layer may be bent and reinforced by using a polymer layer for the bend. Also, grooves can be added to the glass that is aligned to the bent portion. 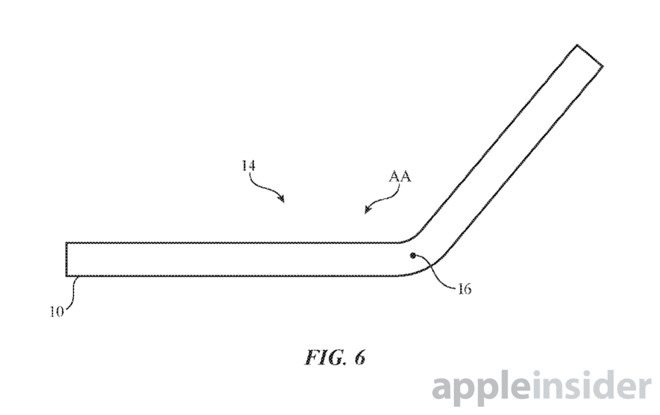 The other parts of the said Foldable iPhone must likewise have flexible materials to protect the outside parts of the fold, along with a hinge in the middle to sustain the bend that takes place at a certain point within the flexible portion. The application filed by Apple on the 8th of June 2016 acknowledges the following investors: Jiang Ai, Erik A. Utterman, and Soyoung Kim. The most current patent is the same as the other applications that Apple has filed with the USPTO in the past years. Another filing in October 2017 has it that Apple is corroborating with LG to manufacture an iPhone with an OLED display that would be launched in 2020. Wamsi Mohan, Merril Lynch analyst, wrote investors last March saying that there will be a corresponding launch date for the gadget likewise stating that it could similarly be used as a tablet. This would give the device a bigger screen but is handy as a smartphone. One other patent awarded to Apple in November 2016 recommended the utilization of a hinged along with an OLED panel. The device is supposed to have a flexible metal back to produce a smartphone that could be folded or stored and clipped onto clothing while not being used. Apple constantly files patent applications with USPTO but this does not mean the company is currently working on Foldable iPhone, and neither is it a guarantee that any products from the patents will be released for consumer usage. Although the concept for the foldable phone patent may be utilized in other Apple hardware and not exactly on its mobile gadget.